Up to 1 and a half hours in the studio allowing for a relaxed session with outfit changes, shooting vintage style Hollywood Glamour, soft focus 'natural light' or contemporary boudoir styles, the choice is yours. Images will be professionally edited for a private viewing. Includes you choice of image as a stunning 24 x 16 inch canvas print. 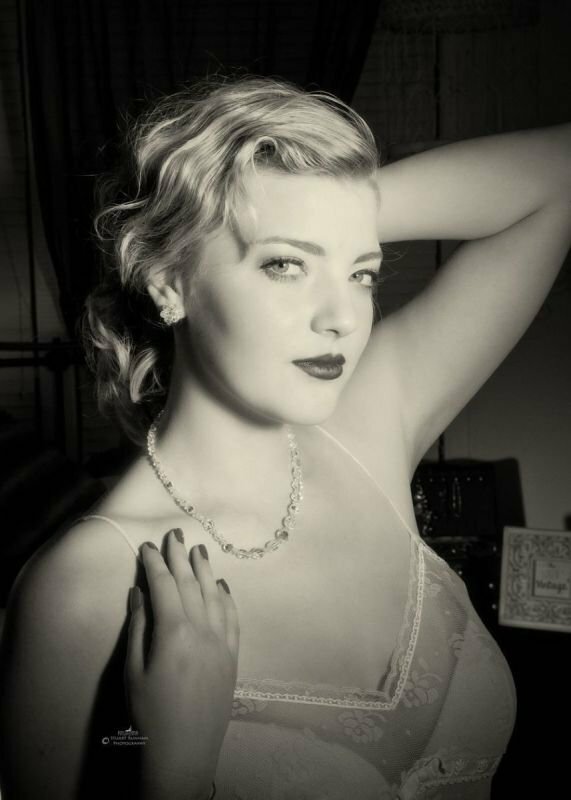 Our photographer Stuart has years of experience with vintage, retro, old Hollywood, pinup and contemporary boudoir styles having exhibited in central London and with numerous publications to his name so you can book a boudoir shoot with us with confidence that you will look amazing. Images will be professionally edited for a private viewing. Price: only £150, to be paid at time of booking. You then have the option to further purchase from our wide range of prints, framed prints and canvases or digital images as you wish. What to Wear? The main thing is for you to feel comfortable during your shoot, though you may find that your confidence grows as the shoot progresses. Boudoir shoots are, of course, associated with lingerie, nightwear etc. but that isn't compulsory. A nice evening dress, just a shirt, almost anything in fact might be suitable. Though if you want an old Hollywood style image, keep that in mind when choosing what to wear. 90 minutes is plenty of time for an outfit/style change or two so by all means bring a number of different outfits. How long does it take to get my images? Typically you will be invited to view your shots a week or so after your shoot, your included canvas print and any additionally purchased prints will then take another week or so.